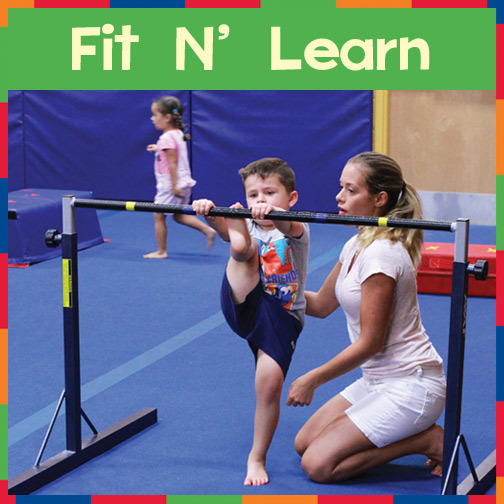 2-3 years: FIT N LEARN, our drop off class (Monday & Wednesday), was designed for children who are becoming more curious about the world around them. Their language, cognitive, fine & gross motor skills are growing every day. This program is a great opportunity for small children to spend quality time meeting new friends, having fun & encouraging those skills. Twice a week the children will experience and explore a new theme, which will be reinforced within the class curriculum. Children will interact from the moment they walk through the door with songs, stories, finger plays, games, instruments, activities, or art. Children will enjoy interacting with other children their age, as they learn & create in a safe, nurturing environment guided by an experienced teacher. Most likely this might be your child’s first time being away from Mom, Dad or Grandparents so we understand and are prepared to help you and your child during the transitioning process. Every child is different and we work very hard to provide your child with what they need to be successful. As is every child different, every parent is different and you too must be comfortable as well so please feel free to express your thoughts as you know your child best. Our goal is to work as a team to make this a fun and successful experience for all. 1. Crying at drop off: based on parents comfort level of having their child cry, usually it is best for the child if we take them in even if they are crying. Rip the Band Aid Method, not as bad as it sounds. We do not drag them to scar them. I promise! Our teachers will nurture them and work them through the transition into activities as long as it takes them. It is easier though if they don’t see Mom or Dad during this time. ** Day 2 is usually harder for first time friends as they now know whats coming. Everyday transitioning will become easier and you will be impressed as how quickly they start waving you good bye ? 2. “Behavioral Issues”: We find parents often become upset or apologize for their child’s behavior as if we have never seen this before, so we want you to know there is no need to feel bad as this is common behavior of this age group as they are usually testing boundaries. Our philosophy here at gym tiME is to teach children in an age appropriate manner. And for Fit n Learn they are 2 and 3 years old so our focus is to support parents and extend your family’s “village” by providing a safe environment where they can explore new social interactive skills and practice skills of following directions, taking turns, using their words, and being kind to friends. As all humans do, we sometimes make mistakes when using new skills and that too is learning. Behavior Re-Direction is when we provide clear expectations as to expected classroom behavior. If a child chooses to behave outside of the expectations or unsafe then a re-direct warning is provided. If the behavior is continued excessively or unsafe then a “safety break is required” which requires a child to sit for one turn and before they return to activity the teacher will provide the child with a short expectation reminder. “We are not playing on the trampoline right now, we are staying on the big blue mat.” Children are given do-overs so they are never considered “our bad kids” as this is not how we look at them, ever! Activity time…teacher demonstrates small circuit of activity and provides children with the expectation of staying together. “Ok friends, do we go play on the bars…no, do we jump on the trampoline…no, where do we stay (on the big blue mat) awesome! Ok go play!” If a child leaves the mat “Johnny, no thank you we are playing on the big blue mat right now” If child continues then teacher may go and help the child back to the mat. As this is the skill they are learning, following directions. If the child is then determined to not stay with the group… “Johnny it is not safe to play without Miss Meghan..please come back to the big blue mat or we have to take a safety break”. If child listens..”Thank you Johnny for being a great listener – high five” If the child chooses to continue to not stay with the group “Ok Johnny its time for a safety break, it’s not safe to play without Miss Meghan – lets sit because we were not being safe” Child will sit for 1-2 minutes while friends are playing. “Johnny, it is not safe to play without Miss Meghan- where are we playing? Big blue mat, Thank you!” Child returns to activity. After decades of coaching we feel that children of this age group are not malicious by nature but safety is important to us and our parents so when a child is making an unsafe choice (running during bubbles or rolling down wedges onto friends) we will provide a Behavior Re-Direction to teach them to become aware of their surroundings. Childhood Development is our expertise and our coaches are trained to present instructions using appropriate child development expectations (example; shoes on, wash hands, sit in a blue chair). Children of this age are learning to following multi-directions so they will be provided 2 or 3 instructions to practice this skill as we transition from room to room.